This year’s Spring Lunch was held on Wednesday 26th April at Thai Silk in verdant Isabella Street, near Southwark tube. 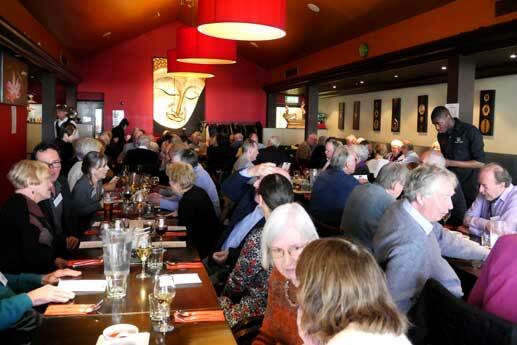 Around 75 members and their guests assembled for drinks in the bar, before enjoying an excellent 3-course Thai meal in the restaurant, watched over by a large bas relief of a golden Buddha. As well as the ‘regulars’, there were a number of familiar faces who had not attended events recently and several guests, some of whom said they would sign up as members. By all accounts, the party continued for some time afterwards in the Thai Silk bar and the nearby Hope and Anchor.